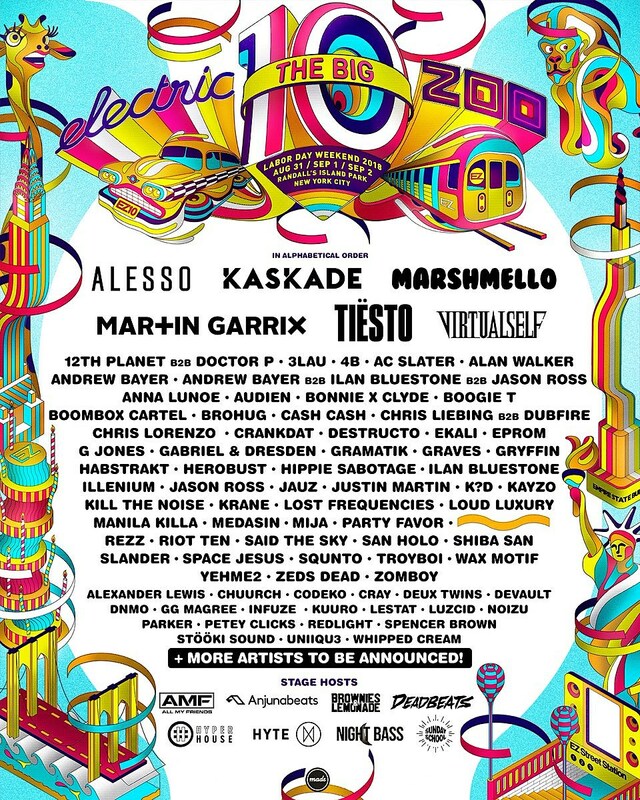 NYC EDM festival Electric Zoo has announced its phase two lineup, including the reveals of headliners Alesso and Tiesto, who join previously-announced headliners Kaskade, Marshmello, Martin Garrix, and Virtualself. Several other acts have been announced too, including Alexander Lewis, Bonnie x Clyde, Boogie T, Brohug, Chris Liebing, Chris Lorenzo, Chuurch, Codeko, Crankdat, Cray, Destructo, Deux, Devault, DNMO, Dubfire, G Jones, GG Magree, Habstrakt, Infuze, Jauz, Kayzo, Kuuro, Lestat, Lost Frequencies, Loud Luxury, Luzcid, Medasin, Noizu, Parker, Party Favor, Petey Clicks, Redlight, Space Jesus, Spencer Brown, Squnto, Stooki Sound, UNIIQU3, Whipped Cream and Yehme2. Plus even more acts are TBA. Tickets are still available. Updated lineup, and a gallery of pictures from last year, below.